Asturias, (said by some to be the "Real Spain" due to not having been overun by the Moors) on the northern coast, has what may be some of the most stunning scenery in Spain. Not suffering from the lack of rain further south, yet still a few degrees warmer than southern UK, you will find a great diversity of plant and animal life with a rugged Atlantic coastline to the north and a dramatic mountain range (Picos de Europa) to the south. This is very different to the well known tourist areas. Along with other regions of northern Spain, the province of Asturias is known for its gastronomy (particularly seafood) and the local cider. 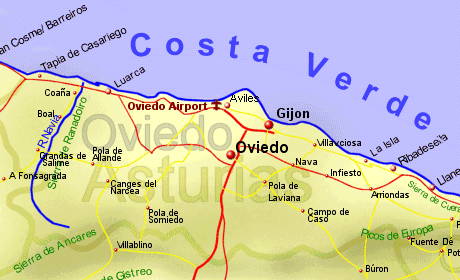 Oviedo city has a fast train service connecting it to Valladolid and Madrid. There is also a narrow gauge rail service (the FEVE) which winds it's way along the coastline, through the cities of Oviedo, Gijón, and Avilés. The line runs for around 800Km in total from the French border to the north west corner of Spain.